I won’t lie, I am always waiting on some seasonal beer that will be released in the next week or two. I will always appreciate the beer that is in front of me, but there are some really great beers out there that are only released once or twice a year. Waiting for those beers can make me feel like a kid that’s counting down the days until Christmas when it’s only March. Luckily, there are so many great breweries operating now that something special is being released almost every day, and I got to drink two of those special beers in the past couple of weeks. Both are really great examples of heavily hopped beers and there is a reason they just became available now. 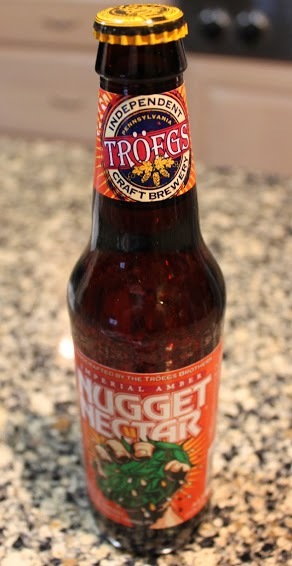 The first was Tröegs Nugget Nectar, that my buddy Rob picked up for me at the brewery on the day it released. This is Tröegs’ Imperial Amber Ale, which is the Imperial version of their HopBack Amber Ale. The recipes for the two beers are similar but the Nugget Nectar has been scaled way up, especially in the hops department. If these beers were brothers then HopBack would be the younger one that plays first string for the high school JV team, while Nugget Nectar is the All-American running back on his way to the Rose Bowl. The second beer was Enjoy By 02.14.14, from Stone Brewing Company. That’s right, the beer’s name tells you to enjoy it by a certain date. This isn’t exactly a marketing gimmick either, it’s a practical way for Stone to make sure customers are buying and drinking this beer before all of its hoppy goodness has been lost to the ages (it’s also a little bit of a marketing gimmick). I got to drink Enjoy By at Lures, but I wasn’t alone. When Casey and I saddled up to the bar we started talking to the neighbor to our left. His name was Ed. Turns out, Ed is a reader of The Beer Spy! And Ed was enjoying the Enjoy By just as much as we were. The intense citrusy American hop flavors of calamansi, grapefruit, and tangerine were enjoyed by all. In fact, we were all drinking it in that night because its incredible hop flavors need to be enjoyed by the date that its name suggests. Hops contribute bitterness, flavor, and aroma to beer, but the fact is that hops’ contribution is short-lived. The bitterness will stick around longest, but the aroma and flavor dissipate quickly. A beer will start losing its hop aroma in a matter of weeks, and flavor loss will be noticeable within a month. That is why hoppy beers are not meant to be aged. That is also why Enjoy By has such a short window of time from leaving the brewery to its expiration date. 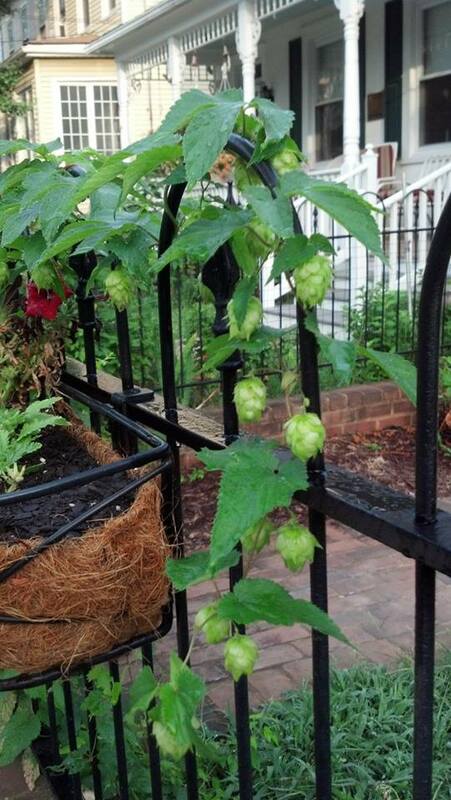 Centennial hops growing along my fence here in Annapolis. You can get great hoppy beers all year long (or make them yourself), but there is a reason so many great hoppy beers are coming out right now, and it has everything to do with growing and harvesting hops. These delicious little flavor bombs are actually cone shaped flowers from a female hop plant. The plants sprout in the spring, grow all summer long, and the flowers mature in late summer or early fall. 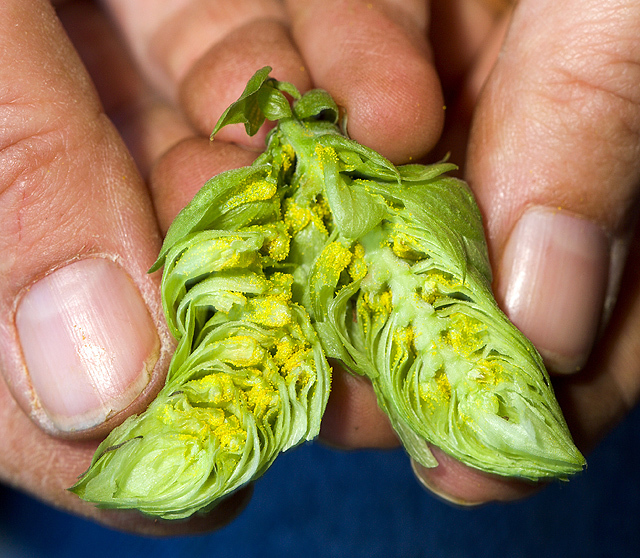 The hop cones (flowers) are harvested in late August through September, when they have their highest amount of lupulin, an oily yellow substance that contains all of the oils that provide the bitterness, flavors, and aromas that hops contribute to beer. A look at the lupulin inside a cone (flower) from a female hop plant. These hops hit the market by the end of September or early October, and brewers immediately put them to use while they’re at their peak of freshness. Brewing beer takes time, and these great hoppy beers are ready to hit the shelves around January and February. Looking for great hoppy beers that are available all year? Got my first crack at Stone’s “Enjoy By” series with the 2.14.14 a couple weeks ago—-sooooooo good!! So glad you got to try this beer! Where did you find it? Same here! I had it on draft at Kudu in downtown Charleston. I love Charleston! Have you been to Ted’s Butcher Block? Charleston is pretty awesome. Nope haven’t been there yet–but it’s on the list!